It will compete most directly with the Indiana Strat copy — the one that’s covered with stickers and upgraded with two lipstick-tube pickups in the neck and middle positions. 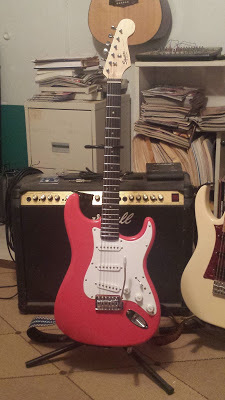 Aside from the lipstick pickups, they are essentially the same guitar, at least superficially. What remains to be seen is if they have the same tone, feel, and vibe… or if they each have their own unique personality. This guitar was definitely an impulse purchase. I was not supposed to be buying any more guitars. I haven’t bought any for quite a while. Money has been a little tight; but more to the point, I seem to have everything I need to get the sounds that I want to get. No matter what sound I’m looking for — acoustic or electric, hard or soft — I can pretty much pick up a guitar in my collection and get that sound. So I was pretty happy with the stable the way it is. See what a lucky guy I am? Next Article As the Texas Candidates Try to Out-Conservative Each Other….